Water aerobics is great for seniors with limited mobility. 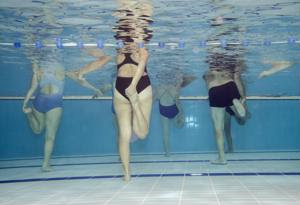 Water exercise is an excellent option for seniors because it removes any risk of falling and getting hurt. It's also beneficial for those with arthritis or limited mobility because the buoyancy of the water takes the stress off of the joints, allowing for a more painless fitness experience. Punching and kicking: Like kickboxing on land, this is a great cardio workout that can also build muscle. Instruct your clients to stand in the water, keeping their abdominal muscles tight. First they should bring their fists up to shoulder height, then alternate punching right and left 10 times. Keeping their fists up, they should then alternating kicking forward right and left 10 times. Jumping jacks: While doing jumping jacks on land can be hard on joints, in the water it's less pressure but still effective. Tell your clients to stand in the water with their feet together and hands at their sides. From there, the can jump into the basic position and back again. Repeat this 8 times. Skiing: Have your clients start in the same position as for jumping jacks. This time when they jump, their right foot steps forward and their left foot steps back. Have them jump again bring their left foot forward and right foot back, and they should swing their arms through each jump. Have them alternate 10 times.